Although I've occasionally posted lists of books that I use in my Mother Goose on the Loose baby storytimes, today I'm going to post about the program itself. Before I do, I want to urge you to attend a Mother Goose on the Loose training with Dr. Betsy Diamant-Cohen because it is FABULOUS. My staff and I attended a one-day workshop where we got hands-on training and we came away excited about the program and confident that we could offer it ourselves. Our patrons love the program *and* it's easy to offer every week because a lot of it is repeated from week to week. We hold Mother Goose on the Loose for 0-23-month-olds on Tuesdays and Wednesdays at 10:00am. It's drop-in and we generally have between 5-10 babies at each session (siblings are always welcome). Last summer we only offered one session and it was getting really crowded with between 15-20 babies at each session, so we expanded our offerings. The attendance has gone down towards the end of our spring series, but I'm hopeful that it will pick up again in the summer. As the babies age out, they "graduate" to Toddler Time. We started offering this program in January 2010, after my staff and I attended the aforementioned Mother Goose on the Loose training (seriously, do it - you won't regret it!). After doing the program straight from the planning pages of the book for awhile, I've come to customize my plans for it so that I'm doing what works for me and what my patrons seem to like. Greet Parents/Spiel: I make sure to tell them that it's okay if their little one is walking around or making noise. That's what babies do! It's more important to me that this be a positive experience for all the kids than for it to be "orderly". I also make any announcements that I have. Would FLY through the air on her very fine gander! I repeat this rhyme and let them know that they can lift their child or their arms up on the word "fly" if they want to. Again, we say it twice and I let them know that they can lift their child or their arms on UP if they want to. Book: I choose a different book each week and I try to choose something that encourages the parents and kids to interact in some way. I like books that I can sing, books with a repeated refrain (especially if I can pair a motion with it), or books where we can count together. If a book is long, I shorten it! 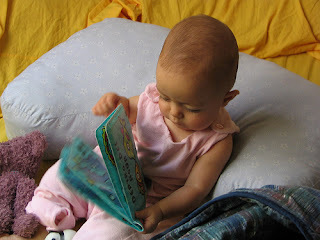 I have compiled a few lists of the books I have successfully used: What to Read at Baby Storytime #1, WTRABS#2, WTRABS#3. I totally stole this from Mel's Desk! Rhyme with Puppet: I do a nursery rhyme with an animal puppet. When I first started doing this, I was choosing a different rhyme for every time and having a hard time coming up with enough animal rhymes for which we had puppets (we have a very weird puppet collection). Now, I pick three or four rhymes for the 8-14-week series and I'll repeat each rhyme for several weeks. For instance, I'll do "The Bear Went Over the Mountain" for four weeks in a row and then switch to "Hey Diddle Diddle" for four weeks, etc. I always say the rhyme twice and ask parents to join me if they know it. For some of our attendees, English is not their first language, so I never assume that everyone's going to know a rhyme. After we say the rhyme, I take my puppet around the circle and say hello to each child. This helps them get to know me and feel more comfortable with me. I repeat with different actions: clap our hands, nod our heads, we sway from side to side, we all say hello! Flannel Board Rhyme: I choose a different rhyme or song here each week and usually only use one basic flannel piece for it. I ask parents to touch each body part on themselves or on their child to help them build that vocabulary. Fingerplay or Other Body Rhyme: I choose a different rhyme each week here. Went to town, one by one! But Uncle John went on and on and on and on! I repeat it and sometimes I'll do another knee-bouncing rhyme because we all love them so much! And what do you think the cow did say? 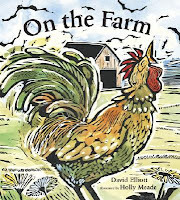 As we're saying this rhyme, I use a farm animal book to show pictures of different farm animals. 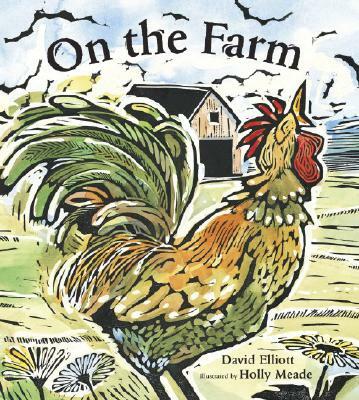 My favorites are The Very Busy Spider by Eric Carle and On the Farm by David Elliott. This was a tip from Betsy Diamant-Cohen - using books in this way for a song shows parents that they don't always have to read every word on the page in order to learn from and have fun with books! Choose a book with large, clear pictures of the animals. Then I go around the circle and give each child a chance to hit out the syllables in their name. If kids are too little to do it, parents can take their hand and help them. And we do one beat for each syllable. I demonstrate with a couple of names, either of my staff or of some of the kids in the room. This is a GREAT activity for phonemic awareness and would be great to do with older children, too. By the time my babies get ready to graduate, some of them are doing this on their own. This is also a great activity for me so I can learn all their names. Humpty Dumpty (repeated every week): After we put the bells away, it's time for Humpty Dumpty! We all say the rhyme together and then I put my felt Humpty Dumpty up on the felt board and invite each child to come up to the board and pull Humpty off. After each child has his or her turn, we give him or her a great big round of applause. It is amazing how fast the kids learn how to do this. I remember the very first week of offering Mother Goose, the kids all just stared at me. Now they know as soon as we say the rhyme and they get so excited about it! Goodbye Song (repeated every week): "Do You Know What Time It Is?" After we sing our goodbye song, I bring out some toys, put on some music, and we have about 10-15 minutes of play time. I always pull a little display of books and encourage parents to check them out. If I'm on top of things, I grab some music CDs and baby sign language DVDs to add to the display. Somewhere in the program, I throw in at least one developmental tip. I write them on small post-it notes and on my planning sheet I indicate where I want to interject it. This can be as simple as explaining why it's good for little brains that we practice animal noises. As you can see, a LOT of the program is repeated from week to week. I always change up the book, a few of the rhymes and fingerplays, and the music we use with the bells. I'll also usually change up the marching activities. And whenever I get bored, I'll switch up one of the repeated rhymes for the series. If you do baby programming, make sure that you're checking out Jennie's Library Noise blog where she blogs about her baby storytimes and Mel's posts about her baby storytime over at Mel's Desk. Do you do baby storytime at your library? What are some of your favorite books, rhymes, or songs to use?